Proving that heroes can come in every shape, size and age, an elderly couple not only returned a man’s wallet after he’d left it at Starbucks, but wrote a note to him explaining why they weren’t able to catch up with him in time, and expressing concern that he’d been upset when they saw him walking off without it. Consumerist friend Kara posted a photo of the typed note posted on the board near her local Los Angeles Starbucks, near where the milk and straws are offered. Frances writes that she and her husband would’ve caught up to the man named David if they could’ve, and they would’ve written their note by hand as well, but they’re older and such things don’t come so easily. Despite that, Frances didn’t leave the note unsigned, scrawling a wobbly yet legible autograph in addition to the typed closing. My name is Frances and my husband and I found your wallet at Starbucks. We tried to catch up with you when we noticed you left it behind. We are older and could not catch up. Please excuse this impersonal typed note but our arthritis is very bad and [we] can not write very well anymore. We noted you were very upset when you left the store. We hope you are oak and the return of the wallet is helpful. We do not want a reward so have not included our address. 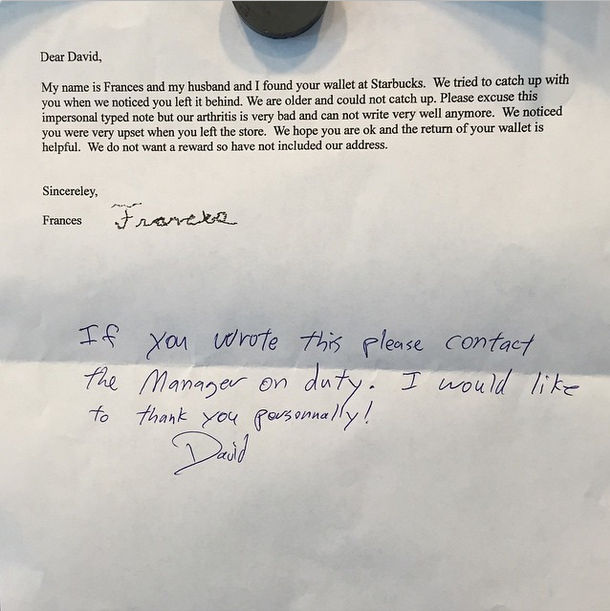 David sounds ecstastic about the return of his wallet, choosing to post Frances and her husband’s letter on the board with his response, so all can see how the good people of this world go about spreading warm, fuzzy feelings. “If you wrote this please contact the manager on duty. I would like to thank you personally!” David wrote by hand on the note. Now we can all go ahead and enjoy the weekend with renewed faith in our fellow humans. Happy Friday, y’all.